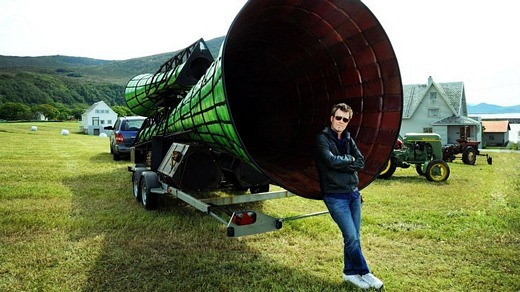 Magne opened the third annual “Go With The Flø” art festival with a special fanfare on Sunday, June 24th, performed on “Desibel”, the world’s largest mobile horn, and featuring audio samples of tractors, local cows and workers at a nearby shipyard. Last month, Magne stated that the bass frequency created by “Desibel” is capable of physically moving a cow. Luckily, no cows were tipped over by the sounds coming from the massive horn, but the fanfare did manage to make a bunch of them run away in panic. “Hugo [Opdal] asked me if I wanted to turn the sound recordings into music. Which I was happy to do. It’s become a musical interpretation of the area”, Magne told newspaper Vikebladet on Friday. The fanfare can be heard in this clip on YouTube. Later on, British musician Robyn Hitchcock played a concert at Vonheim, the local village hall. Magne, along with Anne Lise Frøkedal og Frode Strømstad, joined Hitchcock on stage. A video from the concert can be seen here. Around 2000 people found their way to Flø during Sunday’s festival. “Everything is special at Flø. The village has become a center of experimental behaviour. In my opinion, this is the most tolerant village in Norway. When we arrived with the horn, the locals stood by the road, smiling and waving”, Magne told Sunnmørsposten.